I have long been a fan of Grace Kelly, just because she is beautiful. Outwardly she epitomizes the woman I had hoped to become, beautiful, gracious, feminine, composed. I have read books about Grace Kelly and know that things were not all perfect. But I think it is okay to dream and strive for the qualities you admire. For various reasons I have a lot of role models. A more contemporary idol is Christie Brinkley. Christie was born six days before me, and I often tell people that God waved his magic wand and said, "She gets it all." (Laugh) She is tall and beautiful and talented and rich. Wow! What a combination. However, we all know that isn't all there is in life. And though I am short, and round, blond haired and green eyed, I am not too awful to view, I wouldn't change it. I have a beautiful full life with great friends and a husband who loves me. Doesn't that sound like perfection to you? My focus here was really to tell you more about Princess Grace' wedding dress which was my inspiration for the small figure you have watched getting dressed these past weeks. In the book The Bridesmaids by Judith Balban Quine her dress is described thus: " ...contained 25 yards of silk peau de soie, another 25 of light silk taffeta, 98 yards of silk tulle, and nearly 320 yards of Valenciennes lace." " The bodice of her dress was of the Val lace. A stiffened stand up collar rose up the sides of Grace's swan-like neck, dipping into a V just at the base of her throat. The sheer lace was fitted perfectly to her shoulders and slim arms, down the full length of sleeves that ended below her wrists in scallops covering the small part of the backs of her hands. Underneath the bodice, one could vaguely distinguish the taffeta strapless underbodice. Grace's white lace covered buttons led down to a high, pleated taffeta cummerbund. Her tiny waist was emphasized by exquisitely full belled white taffeta skirt. In the front the skirt had side gathers and fell to a perfect circle on the floor. The back of Grace's dress divided to reveal masses of Val lace which, together with the taffeta, constituted her train. Again, Grace's hair was pulled straight back ... (into a ) chignon set low on the back of her head. A stiffened Val lace skull cap closely framed her head. Shaped like an inverted sweet heart neckline, with rounded points at the center and just above her ears and it was cut into semi circles above each brow. ... Her white tulle veil was bordered with Val lace. When the front of the veil was dropped over her face it reached the middle of her cummerbund. More than 90 yards of tulle tied with stiffened bows of lace and taffeta, trailed down the back of the headdress, coordinating to the same motif on the rain of her skirts. Seed pearls adorned her Juliet cap as well as the bodice of her dress." I also read in another description from the Philadelphia museum which has her dress that the beading completely covered any seams. Amazing. I will do one more article about this dress which will show some close-ups of the details of the doll including her bouquet and will tell you about them. I want to thank you for all the personal notes and comments on this doll. 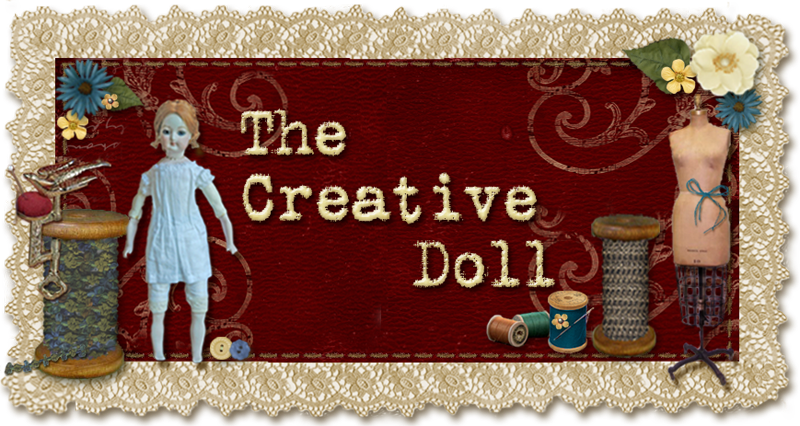 I really appreciate you and your continued reading of the Creative Doll. Michelle and I want to bring you interesting, challenging and inspiration for your doll-making projects. There is much to describe as there are many things that happened between the last presentation. Of these things, the blouse has been beaded and aurora borealis stones added. It is a shame I couldn't get the twinkle right in the pictures. The jewelry, a simple "platinum" band with stone, and "diamond" earrings. Her veil is silk illusion with appliquéd with lace which was beaded and had stones added. I made the veil in a square and not a round. (I will produce this in a pattern for late summer publishing and you will be able to choose a rounded corner or a squared corner.) The veil is attached to a lace coronet which is also beaded with pearls and stones. Her bouquet is created with "silk paper" with lilies around the bottom, a small circle of fantasy flowers with aurora borealis centers, and a well formed center rose. It is wrapped like contemporary bouquets. I hope you have enjoyed watching this doll be dressed for her wedding in her grandmother's gown. I have packed her away until I can figure out how she will be displayed. Thank you so much for your support and I look forward to bring more projects as this one to you. Stay tuned, I have plans!!! There are even more items list on my New Items page. Plus there are even more coming. Stay Tuned and Create! This description from the Philadelphia Art Museum display stated: The dress, created to complement the "fairy princess" beauty of the actress, features a bell-shaped skirt of ivory peau de soie supported by petticoats, and a high-necked bodice of Brussels lace, which was re-embroidered to render the seams invisible and then accented with seed pearls. Continuing the theme of pearl-embellished lace are the bride’s prayer book, shoes, headpiece, and circular silk net veil—designed so that Miss Kelly’s face could be seen. As I stated in a previous Blog the wedding dress is worn in two parts. There is a lace dress and a silk skirt with cummerbund over the lace. I have to concern myself with scale and bulk at this point, as there are already several layers of clothing to achieve an historically correct or technically correct dressing of a figure. That is usually my aim, not only a pretty doll, a correctly dressed one. I have allowed myself some liberties, as this is a contemporary young woman wearing her Grandmother's dress. She prefers some modern accessories, such as pantyhose and contemporary shoes. Her bouquet will be au currant and we have not made any decisions about jewelry, though I can tell you she is not wearing any heirloom diamonds from her fiancé. What her engagement ring and wedding band look like, I have no idea…yet. I do not even know if it is platinum or gold. However, I digress. Today we are taking a peak at the lace dress. I have shown a picture of her dress and the pinning and starching process while it dries. I do want the gown to hold its shape. I starched the lace to hold pleats and ruffles. The dress is very light and not stiff when touched, however. I used about 1 1/2 yards of 2" lace to accomplish the lace dress. Sewn to the front are size 20 beads, which will decorate her hairdo as well. I have not yet decided to bead the entire bodice. The reason is these beads are TOO large for a scale doll. I am not sure I have enough of the size 24 beads for the whole bodice. Such is life and having a stash. When you finally pull out the good stuff to use it, invariably there is not enough. One compensates in other ways. So far no more beading, but that is not a "final answer”. You may also note this is where I start dropping off the fabric. To maintain a small waist and hips, I have forgone the front of the lace dress and only created the back dress design. You will only see this lace when the figure is completely dressed. I have used the side of the slip as my side of the dress line.